NEW YORK (CNNMoney) -- Ben Bernanke renewed his calls to Congress to stop holding the debt ceiling hostage. "I fully understand the desire to use the debt limit deadline to force some necessary and difficult fiscal policy adjustments, but the debt limit is the wrong tool for that important job," the Federal Reserve chairman said at the annual conference for the Committee for a Responsible Federal Budget in D.C. on Tuesday. Republicans have recently tried to tie a debt ceiling increase to spending cuts, as well as completely unrelated proposals. But if the debt ceiling is not raised, Bernanke said, the United States would be forced to stop payments on some of its existing obligations, possibly including Social Security and military pay. The creditworthiness of the United States would be called into question and the financial markets could be severely disrupted, Bernanke said. "Failing to raise the debt ceiling in a timely way would be self-defeating if the objective is to chart a course toward a better fiscal situation for our nation," he said. That said, Bernanke was also firm in his call for Congress and the Obama administration to hurry up and agree on a long-term strategy for bringing the country's balance sheet back into the black. The speech reflected one of the core struggles currently facing Congress as it debates how to deal with the nation's $14 trillion deficit. On the one hand, it's clear that lawmakers need to quickly agree on a plan to get the nation out of debt. But the economy is still on shaky ground following the worst recession since the Great Depression. 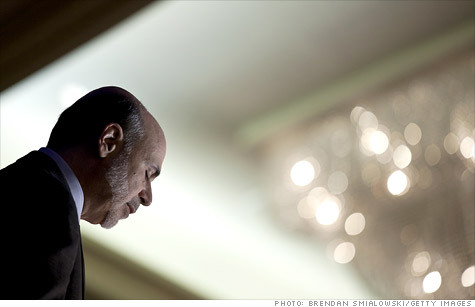 Many economists -- including Bernanke -- say drastic budget cuts now could make it harder for the U.S. to recover. Sudden harsh budget cuts "might put the still-fragile recovery at risk," he said, advocating for a long-term approach instead. Bernanke specifically proposed that Congress commit to clear numerical goals and lay out specific ratios of debt to GDP that decrease over time. He cited the Bowles-Simpson plan as a possible option. That report recommends that spending not exceed 21% of gross domestic product. The Federal Reserve's policymaking committee, the FOMC, plans to meet next week to discuss how to proceed after its $600 billion stimulus program runs out at the end of June. The most recent data show the economic recovery slowed in May, but Bernanke said in a speech last week he believes that weakness to be merely temporary, driven by shockwave's from the Japanese earthquake and surging commodity prices earlier this year. Bernanke will discuss the Fed's economic outlook further in a press conference following the FOMC meeting on Wednesday afternoon.